How would you feel if I told you a natural disaster was about to strike and there was nothing you could do about it? This is what happened on December 26, 2004 when Sumatra, Indonesia was decimated by an earthquake and tsunami. 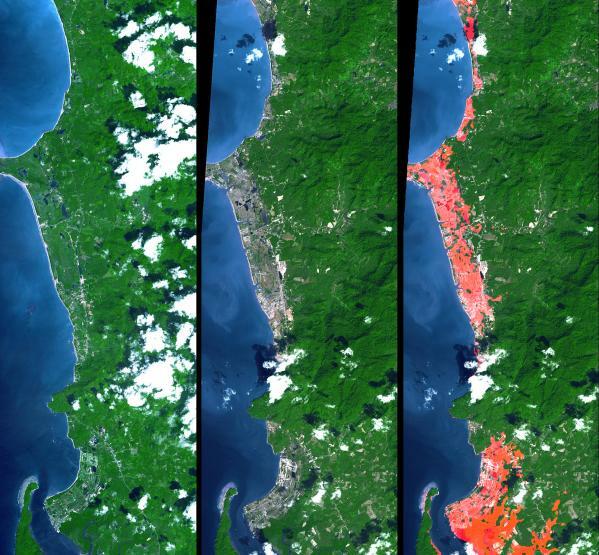 Sumatra, along with thirteen other countries, was struck by the overwhelming natural disaster and roughly 230,000 people were killed. This became known as the Indian Ocean earthquake and tsunami in 2004. This article contains material that will inform you of the physical science aspect of the disaster. This means explaining why the Indian Ocean earthquake and tsunami was a massive catastrophe because of how it occurred, the lack of signs preceding the event, and the aftershocks/effects of the disaster. First of all to understand the physical science aspect of the disaster you must first know how the Indian Ocean earthquake and tsunami occurred. The focus, which is where the earthquake originates, was 30 km underwater off the western coast of Sumatra and was a result of the Sunda mega thrust, which means a long body of land along the southwestern side of Sumatra, rupturing after scientists had claimed it was dormant (Nalbant 2005). This rupture was devastating because it is where the Eurasian and Australian plates are located. The plate shifting between these two caused what became the third largest earthquake recorded in history with a magnitude between 9.1 and 9.3 on a seismograph which is used to measure motions in the ground (McKee 2005). This kind of gigantic seismic activity had the power to trigger a tsunami which hit Indonesia as well. In addition, an alternate cause that scientists have researched that may have triggered the tsunami was mentioned in an article entitled “Moon and rain could mean quakes” which described how full moons and increased precipitation may have an effect on the chance of an earthquake occurring. The article tells how quakes are eighty-six percent more likely to occur when tides are at their greatest in the presence of a full moon and how heavy rainstorms allow water to seep down into the ground and ease the friction of the rocks. This in turn releases built up tension and allows the rocks to move past each other and create tremors underground which will then create tsunamis. Scientists are not sure of the exact cause of the disaster but all of these factors mentioned are the leading theories and more than likely it was a combination of them that caused the Indian Ocean earthquake and tsunami to occur. One of the unique characteristics about the Indian Ocean earthquake and tsunami in 2004 that sets it apart from others is the fact that there was little to no warning that it was going to happen. The only warning the people of Indonesia had was the hours in between the earthquake and the tsunami. The reason for this was that the Indian Ocean lacked a tsunami warning system because tsunamis are a rarity near the Indian Ocean since the last tsunami it encountered was in 1883. Tsunamis typically occur in the Pacific Ocean because of the Ring of Fire which is a location in the Pacific that experiences many earthquakes and volcanic eruptions. Furthermore, tsunamis are difficult to interpret even when you have a warning system because the only detection of a tsunami is an earthquake itself but even then it might not detect the earthquake because it was not strong even though one did occur. The Indian Ocean earthquake and tsunami in 2004 physical aspect was unlike other natural disasters because the earthquake triggered the tsunami. This caused the people of Indonesia and the other thirteen countries to be hit by two large catastrophes simultaneously. This kind of devastation has tremendous aftershocks and effects. For example, the aftershocks of the earthquake caused the tsunami to arise which then led to more small earthquakes to transpire so it was like a ripple effect of terrible incidents. Not only were there physical aftershocks due to the disaster but there were also tremendous effects on the ecosystem as well as the people who live in the countries affected by the Indian Ocean earthquake and tsunami in 2004. For instance, the ecosystem was expected to be in shambles for years to come. Some of the wildlife and habitats being affected are coral reefs, forests, wetlands, and coral reefs. The main cause of the ecosystem suffering is because the disaster caused the freshwater supplies to be poisoned by wastes and it will take years to recover from this severe damage (Falt 2005). Another effect of the Indian Ocean earthquake and tsunami is that because of this monumental crisis the people of Indonesia have become aware of the need of a tsunami warning system for the Indian Ocean. There has even been talk of building warning systems that include the Atlantic Ocean and Caribbean Sea (Global tsunami warning system 2005). This is an excellent idea for preventing future disasters from happening because one lesson this disaster has made clear is that misfortune may strike at any time without warning.